The end of summer often marks a bag of mixed emotions. The kids cry as they head back to school, and then squeal in delight as they are reunited with their school friends. You sigh in relief as they get off your back, and then come to terms with the impending hectic family school-routine of Monday through Friday. It’s really not surprising. With all those sports games, dance rehearsals, math quizzes and field trips scribbled onto the family calendar, sometimes finding the time to pack a healthy lunch can be tough! Our tip? 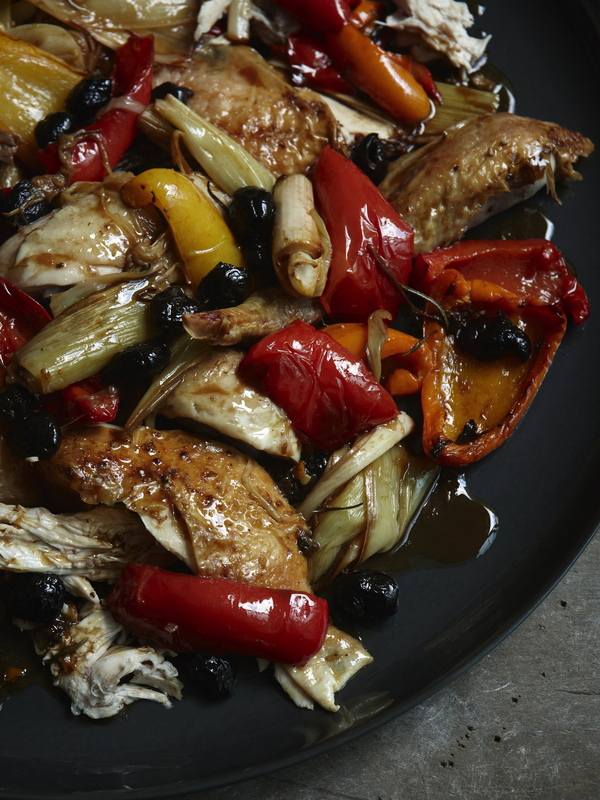 Pick yourself up an organic free-range Yorkshire Valley Farms chicken, roast it off in a 375 F oven on the weekend, and enjoy adding a healthy protein into meals throughout the week. Here are some of our favourite school lunch ideas! 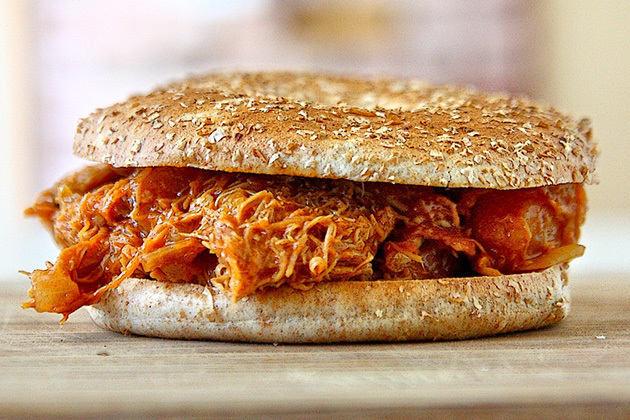 BBQ Pulled Chicken Sandwiches: Mix some shredded cooked chicken with a low-sugar BBQ sauce, and throw it onto a whole grain Kaiser with a little cabbage slaw! Waldorf Chicken Salad: Mix together a few ounces of cooked chopped chicken with diced celery, grapes, diced apple, toasted walnuts, a squirt of yogurt or mayonnaise and a squeeze of fresh lemon. 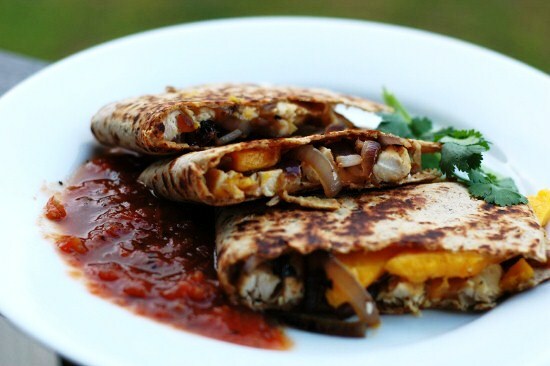 Mango Chicken Quesadillas: Throw a few ounces of shredded cooked chicken onto half of a whole grain tortilla, top with diced bell pepper and mango, and shredded Monterrey Jack cheese. Fold over and panfry on medium high until the cheese is melted and the tortilla is brown on both sides. Serve with salsa or guacamole in side containers. 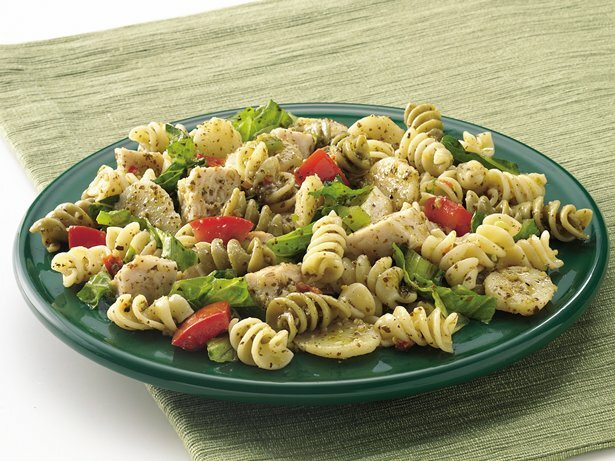 Pesto Chicken Pasta Salad: Mix together some cubed cooked chicken, cooked rotini pasta, store bought pesto, halved cherry tomatoes, and a handful of cubed mozzarella cheese. Leftover Chicken Fried Rice: In a pan heated to medium high, stirfry some leftover brown rice with a handful of mixed frozen veggies, cooked shredded chicken, a beaten egg and a little soy sauce. Toss until the egg is cooked and broken into bite size pieces. 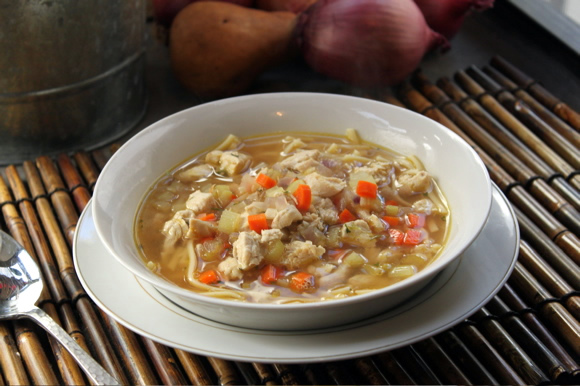 Easy Chicken Noodle Soup: In a large stockpot, heat a tablespoon of oil over medium low heat, then add in a handful each of diced celery, onions and carrots, stirring until they are tender. Add in 8 cups of chicken stock, along with 3 or 4 cups of whole wheat egg noodles. Cook until tender, then add in a few cups of cooked cubed chicken and a handful of frozen peas. Once warmed through, transfer to thermoses for lunch. See? Packing up healthy school lunches doesn’t have to be such a hassle. And while we probably can’t help you with the math homework editing or the school science project, we hope having a few go-to healthy lunch ideas will make back-to-school time mean what it should- more, not less, free time! Preheat the oven to 400°F. Untruss the chicken, sit it in a roasting pan, and put the lemon halves and 2 of the rosemary sprigs into the chicken’s cavity. Cut each leek into 3 logs, then slice lengthwise and add to the pan. Now, remove the core and seeds of the bell peppers and slice them into strips, following their natural curves and ridges, and add these to the pan. Tumble in the olives, and now pour the olive oil, mostly over the vegetables but a little over the chicken, too. Add the remaining rosemary sprigs to the vegetables, along with some salt and freshly ground pepper, to taste, and, using a couple of spoons or spatulas, gently toss the vegetables about to help coat them with the oil and make sure everything’s well mixed up. Sprinkle some salt over the chicken and put it in the oven for about 1–11⁄4 hours, by which time the chicken should be cooked through, and its juices running clear when you cut into the flesh with a small sharp knife at the thickest part of the thigh joint. The vegetables should be tender by now, too, and some of the leeks will be a scorched light brown in parts. Remove the chicken to a cutting board and, while it rests (for about 10 minutes), pop the pan of veggies back in the oven, switching the oven off as you do so. Cut the chicken up chunkily, transferring the pieces to a large warmed platter. Now take the pan back out of the oven and, with a slotted spoon or spatula, remove the vegetables to the large platter and when all is arranged to your aesthetic delight, pour over it all the bronze, highly flavored juices that have collected in the pan. Cut off any fat, bone, and gristle remaining on the chicken thighs. Place two thighs between two sheets of plastic wrap. Pound them lightly with the toothed side of a meat mallet to a more or less even thickness. Season the chicken thighs lightly with salt and pepper. Spread out the flour and breadcrumbs on two separate plates. Beat the eggs in a wide, shallow bowl until thoroughly blended. Dredge the chicken in flour to coat lightly, and tap off excess flour. Dip the floured thighs in the beaten egg, and hold them over the bowl to let the excess egg drip back into the bowl. Transfer the chicken, one piece at a time, to the plate of breadcrumbs; turn it to coat with bread- crumbs, patting gently and making sure that each thigh is well coated. Heat the vegetable oil in a wide, heavy skillet over medium-high heat until a corner of one of the coated thighs gives off a lively sizzle when dipped in the oil. Add to the oil as many of the chicken pieces as fit without touching. Fry, turning once, until golden on both sides and cooked through, about 8 minutes. Remove to a baking sheet lined with paper towels, and drain well. Remove the paper towels from the baking sheet. 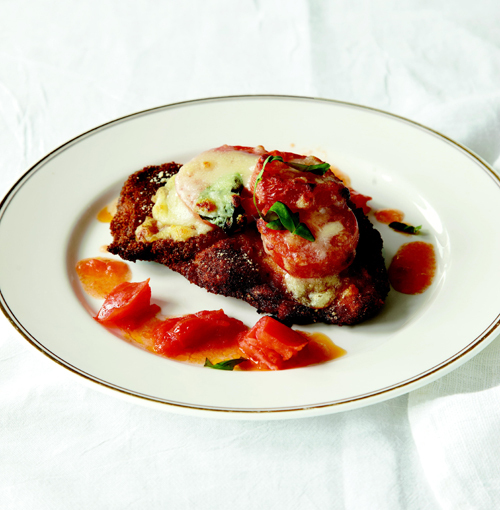 Top each chicken thigh with overlapping slices of tomato, dividing the tomatoes evenly. Drape the sliced cheese over the tomatoes to cover the chicken completely. Prepare the sauce: Heat 3 tablespoons of the olive oil in a wide nonreactive skillet. Whack the garlic cloves with the side of a knife, and drop them into the oil. Cook, shaking the pan, until golden brown, about 2 minutes. Carefully slide the chopped tomatoes into the skillet, season lightly with salt and pepper, and cook until lightly thickened, about 10 minutes. Remove from the heat, an set aside. Bake the chicken until the cheese us lightly browned, about 10 minutes. While the chicken is baking, reheat the tomato sauce to keep it simmering, stir in the basil, and taste, seasoning with salt and pepper if necessary. Spoon the sauce onto a heated platter or plates, and place the baked chicken over the sauce. Drizzle the remming olive oil over the sauce, and serve immediately. 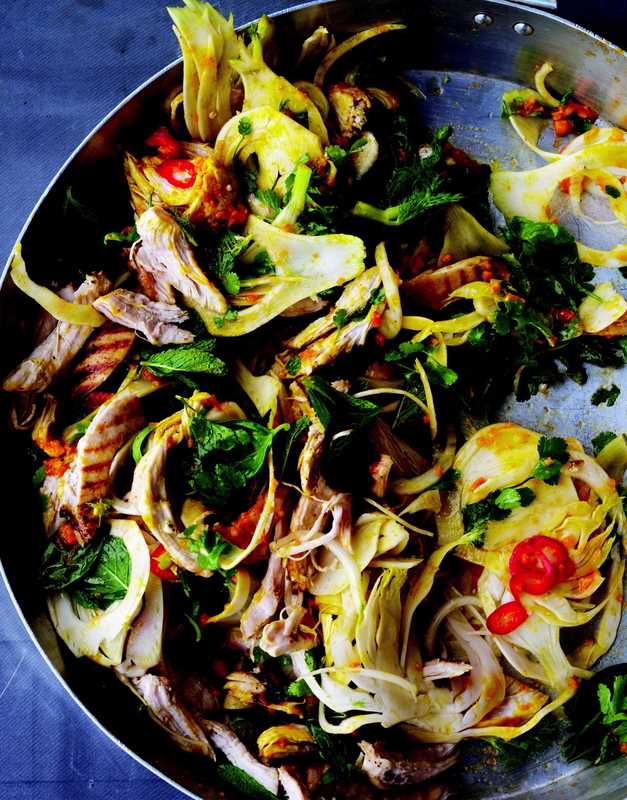 Excerpted from Lidia’s Favorite Recipes. Copyright © 2012 Lidia Matticchio Bastianich and Tanya Bastianich Manuali. Published by Knopf. Reproduced by arrangement with the Publisher. All rights reserved. 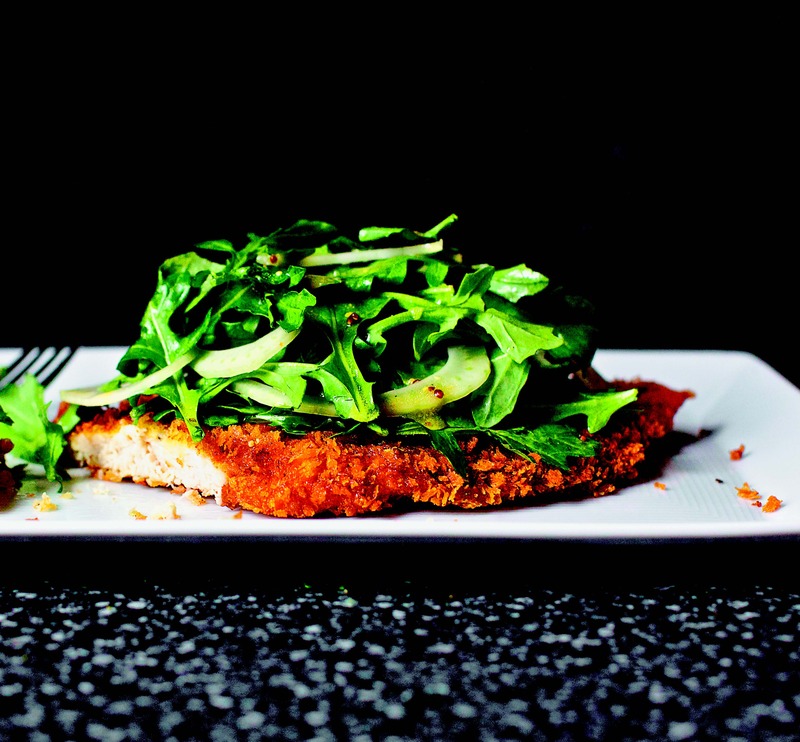 On a cutting board with a very sharp knife, butterfly your chicken breasts, and slice them all the way through, so that you end up with four thin cutlets. With a meat pounder (not a tenderizer), pound your cutlets out between two pieces of plastic wrap to 1⁄4-inch thickness. Season the chicken on both sides with salt and pepper. Grab three big plates, and line them up on your counter. Pour the flour into the first one. In a small dish, whisk together the egg white, smooth Dijon, garlic, oregano, and lemon zest. Pour half of this mixture into the bottom of the second plate. In the third plate, spread out the breadcrumbs. Dredge each piece of chicken lightly in flour, then heavily in the egg-white– mustard mixture, and generously in the breadcrumbs. Repeat with second piece of chicken, then refill egg-white–mustard plate, and repeat with final two pieces of chicken. Arrange the breaded cutlets on a large tray, and chill them in the fridge for 1 hour, or up to 1 day (covered with plastic wrap). This helps the coating set. Pour 1⁄2 inch of oil—use a mixture of olive and vege- table oil, or the frying oil of your choice—in a large pan, and heat over medium-high heat. Test the heat with a flick of water—if it hisses, you’re good to go. Cook the chicken until golden brown on both sides, about 3 to 4 minutes on the first and 2 to 3 minutes on the second. Remove the chicken from heat, and salt and pepper on both sides while draining on paper towels. Once it’s drained, transfer the chicken to a tray to keep in the warm oven. Repeat with additional oil and remaining pieces of chicken. In a small bowl, whisk lemon juice and mustards together, then whisk in olive oil in a thin stream. Pour three-quarters of this into a large bowl. Add arugula to bowl. Thinly shave your fennel bulb on a mandoline, or cut it as thinly as you can with a sharp knife, and add this to the arugula. When you’re ready to serve it, toss the salad. Arrange one piece of chicken from the warm oven on a plate. Drizzle a few drops of the reserved salad dressing directly onto the chicken (you’ll thank me when you try it), and pile the salad on top. Season with salt and pepper, and eat immediately. Tear one or two slices of soft, crustless white bread into 1-inch pieces, and pulse them in the food processor until they are coarsely ground. This will make a generous 1⁄2 cup. Transfer the crumbs to a rimmed baking sheet, and bake them until they are golden brown and dry, for about 15 minutes, stirring occasionally. Cool the breadcrumbs before using them. 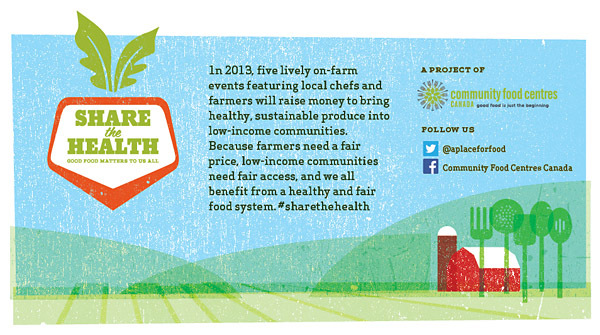 Excerpted from The Smitten Kitchen Cookbook. Copyright © 2012 Deb Perelman. Published by Appetite by Random House, which is a division of Random House of Canada Limited. Reproduced by arrangement with the Publisher. All rights reserved.